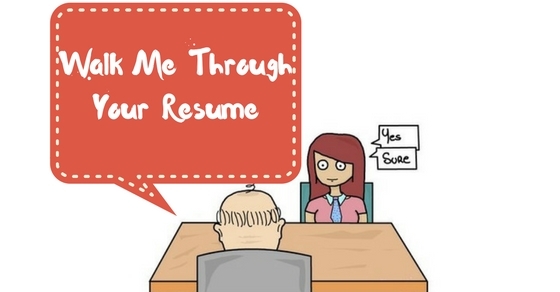 10 Best Ways to Answer ‘Walk Me Through Your Resume’? Every interview will always focus to get the best out of the job seeker. There are many things which impresses the interviewer in just a few seconds. One of the most common thing which represents the job seeker before the interview is the resume.There are many chances that the interviewer might have evaluated the job seeker through his/her resume. But there are also chances that they wish to hear a review of your resume directly in the face to face interview. So, the question undoubtedly would be “Can you please walk me through your resume?” Read this post to know how to answer this question in a smart way. There are many ways of answering this question which might be correct in all different ways. But the apt answer would be what the interviewer expects from the job seeker. Here are few good tips to answer if the interviewer asks a question like ‘walk me through your resume sample’. There are few common interview questions which needs to be prepared well before hand. So, try to list most common interview questions and prepare your answer. It need not be very formal but analyze yourself about the question expected. Walk me through your resume is very common question. So, expect for it foremost so that you do not get nervous when you face it. Prepare a good answer keeping your overall resume content in hand. It is a tough task to judge the interviewer’s expectation on the answer. So the best way is to ask them about the length of the answer or ask their preference about the answer. There are two common ways to answer, first one is to answer it for 3 minutes or less than it and another method is to talk exactly about your previous job histories. So, be gentle and ask them their preference before answering them. One of the common mistake job seekers does is to answer the question in a very lengthy manner thinking to impress the interviewer. It is absolutely not correct to talk in a very lengthy manner for these kind of questions. Always try to stick to most relevant topics to the interview. For example, talk about your overall educational qualification, your previous job experience, your technical strength etc. Try to keep your answer straight to the point rather than speaking about irrelevant information like your school background or your family ground in your answer. There might be flaws in your resume, and there are chances the interviewer might expect you to address that issue while you make them walk through your resume. Never try to cook up new stories or do not exaggerate your merits abruptly. This might create a bad impression as well as create an adverse effect on your image. Try speaking positive about your scope of improvement in future and also show them you are aware of your mistakes in a positive way. There are few interview questions which should not be answered creating on spot answers. One such interview question is walking through your resume. This is because already the interviewer have a clear idea about your resume, and this question is to verify whether you are aware of your content as well to check your clarity level. So, never try to create on spot answers as well try not to move away from your resume’s content. Always try to be honest in your answers. In most of the cases, interviews might have already gone through flaws. For example, you might have taken a long medical leave, or sabbatical for studying. So, before they try to address such kind of issues it is good to speak up when you answer this question. The probability of knowing you through your resume is always high. So do not try to hide or to avoid such gap issues when you answer. There might be few things like you feel to avoid speaking when we you are questioned to give a gist of your resume. Like for example, you might have been unemployed for years together or laid down from your previous organization etc. Yes, it is good to avoid such things but do not answer very consciously so that you might sound like you hide the reality. Try to avoid such things or best way is to stick to answering in two or three words so that you do not end up getting a bad image for hiding reality. It is very natural to get nervous for such kind of questions as it judges your overall personality all together. But remember be it two lines or three lines it should be expressed clearly. Keep your tone same right from you start answering to the end. This shows your confidence about the answer. Speak in a clear tone a bit slowly and speak in a very casual way. It is good to speak what you have prepared but do not lose the soul of the answer by expressing it faster in a very bookish manner. Answer it smartly with a clear tone. Overall aim of the interview is to get your dream job. It is very essential to make the interviewer understand about your dream and your expectations of your career. When you are answering about walking through your resume, make sure you speak about your dreams and expectations about the job. This will create a good impression as well make them clear about goals of landing up in a good job. Even though this answer does not directly link with answering your walking through your resume question, it is equally important to keep yourself cool and calm down when you have not done justice to your answer. Mistakes happen, so do not get worried if you are not satisfied or your performance was not at your best. Remember that you have many chances to prove you about your qualification and your confidence has to be higher to walk down through the rest of the interview. Before we end the post, here are some of our best tips and ideas that can help you speak about your resume in the best way possible. Also, your hiring manager will be very happy if you implement the points given below. Go ahead and read! When you have a gap in your resume and you aren’t sure how to answer that, remember that you have to have an answer ready from beforehand and that there should be a positive twist in it as well. When you are applying for any job, you should acknowledge that it exists instead of avoiding it. Speak about it, describe the reasons properly and talk about why you were unemployed. Later inside the interview, you can speak about the interview at length. Don’t have to go for it unprepared. However, make sure you make it sound positive. Don’t lie and provide honest reasons. We know your resume could be flawed in several ways but do know that it is completely normal. There is no need to become so negative about the whole thing. Negativity can never help when it comes to explaining and speaking about your resume. You have to be as honest as possible, speak what is right and try to portray a positive outlook. People will definitely want to hire you when they see how well you can handle questions like these. Walking me through your resume is one of the most common questions you shall face when you are attending an interview. So one of the smartest things you can do is practise this question from before on and get it ready. You can actually take down a pen and a piece of paper and write down about all the things you will be saying. That can actually help you a lot while getting answers ready. When you are attending an interview and talking about your resume, try to be as clear as possible. Brevity is one key that helps a lot in such fields such as management consultants as well as marketing where your skills of communication have been evaluated. You should work on summarising the skills of jobs and establish a context to the jobs you have already had. Speaking about yourself in the clearest way possible can really help you. Just avoid all the ‘ahs’ and ‘oohs’ people usually tell. This happens to be important when you are trying to fill in all the gaps while speaking to the hiring manager. It will help you show how strategic and thoughtful you are when it comes to managing your career the right way. If you have recently finished college and chosen a different job, talk about it and say how motivated you were to do what you are doing today. If you are happening to go for a career switch, then talk about the threads among all the jobs and how all the experiences which helped you to do as of now. Even though it is very important for you to speak properly and in a contextual manner when it comes to speaking about your background, you must also package all the information in the best way you can. It could be that you are interviewing for any marketing role where the core section of the responsibility could lead to the development of new campaigns that can attract millennials. So when you are talking to the interviewer, talk about the experiences you have had that could help them understand you can handle these things in the easiest and best way possible. Finally, we would recommend you to speak and talk to your friends about how they have been answering questions. People who are professionals and have attended several interviews can actually help you a lot in situations like these. They can give you a better idea on how answering questions at interviews work and how you can impress your interviewer with the best answer. Also if you want you can check out a few websites and links online. They also have some really effective tips that could help you prepare. On a final note, remember even though answering technical part is of prime importance there are few questions which set the mood of the overall interview. Be well prepared and conscious about what you have expressed in your resume. It is not at all big task to easily pass through this question if you have prepared it in all aspects like answering it lengthy or to minimal minutes. Make sure your answer does justice to walk through resume literally and not skipping anything. Hope this post helps you to know the best ways of answering the walk through your resume question. If you have questions regarding the post and have some feedback, please let us know in the comment box below. We would love to get back to you. On that note, good luck and hope you can crack that job interview today!